Vitamin C contributes to normal collagen formation to ensure normal functioning of teeth and gums. Vitamin D contributes to the maintenance of normal dentition. With Sweetener. 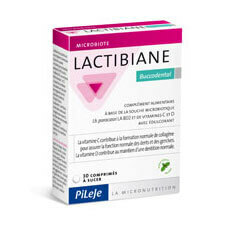 Lactibiane Buccodental is a food supplement with the microbiotic strain Lactobacillus paracasei LA 802 in the dose of 1 billion CFU* per tablet, plus vitamins C and D.
Vitamin C contributes to normal collagen formation to ensure normal functioning of teeth and gums. Vitamin D contributes to the maintenance of normal dentition. The microbiotic strain in Lactibiane Buccodental selectively bred by PiLeJe is registered in the National Collection of Microorganism Cultures (CNCM). Take 1 tablet sublingually after a meal, up to 2 times daily, preferably after brushing the teeth. For adults and children over 6 years old. Duration of use: 15 to 30 days. Usage precautions: This food supplement is not a substitute for diverse balanced nutrition and a healthy lifestyle. Bulking agent: fructooligosaccharides, chicory root inulin and microcrystalline cellulose, lactic ferments (on a chicory root inulin carrier, lactose, milk protein), vitamin C, anticaking agent: magnesium stearate, natural mint flavouring (0.3%), vitamin D3, sweetener: sucralose.